Contrary to many of our friends,we love idli.A relaxed breakfast of idli and piping hot sambhar with some thick coconut chutney on the side is surely our idea of a comfort breakfast.Ever since acquiring a wet grinder,I've been whipping up idli batter in bulk so that we can have dosa any time we fancy and of course those cold leftover idlis which open up so many possibilities for a probable snack. Remember DK's Idli fry which we talked about a while back?Well,I had planned to try it when suddenly this idea popped up.I remember having chilly idli and podi idli in Sangeetha which was actually made with mini button idlis.So slowly the idea of manchurian came up. 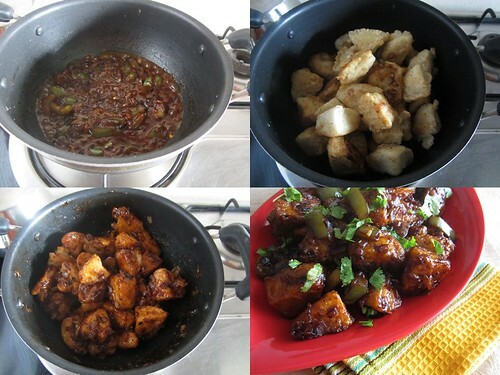 I am sure many of you have heard about or tried this dish,this is my take on it.It is made in a similar way as how you'd go about making a Gobi/Baby Corn Manchurian. In a kadai add enough oil to deep fry.Dip the chopped idli into the batter and deep fry till golden brown and crisp.Drain on absorbent paper and keep aside. 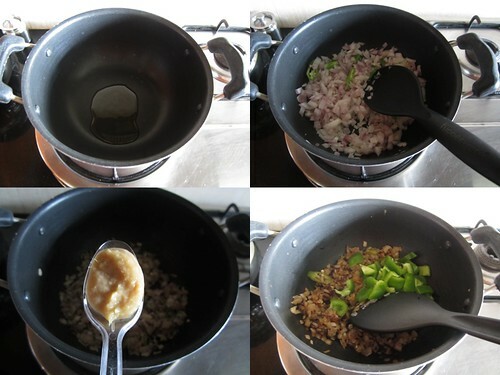 In a non-stick pan add oil and saute the onions and green chilly till golden brown. 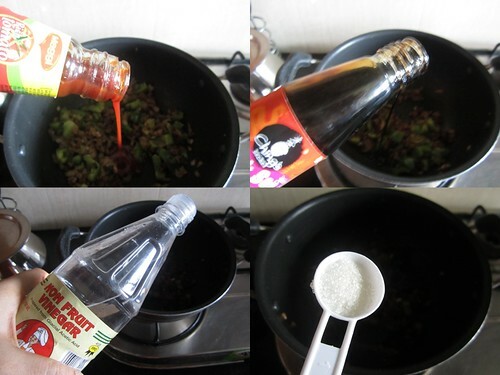 Add the chopped capsicum,tomato sauce,soya sauce,vinegar,sugar,chilly powder and salt to taste and stir well. 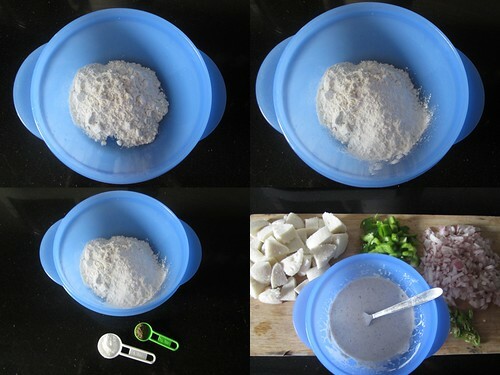 Mix in the fried idlis and stir well till the idli gets coated with the sauce and turns crisp. Switch off the flame,garnish with freshly chopped coriander leaves and serve hot. It is easier to chop the idli when it is cold,so leftover idli works best for this recipe.Cold idli doesn't soak up oil too while frying. Siri Pulipaka - Congrats Siri! Please send me your shipping address to divyakudua@gmail.com at the earliest and your prize would be on its way! Absolutely lip smacking and very inviting! Great pictures Divya..loved it! 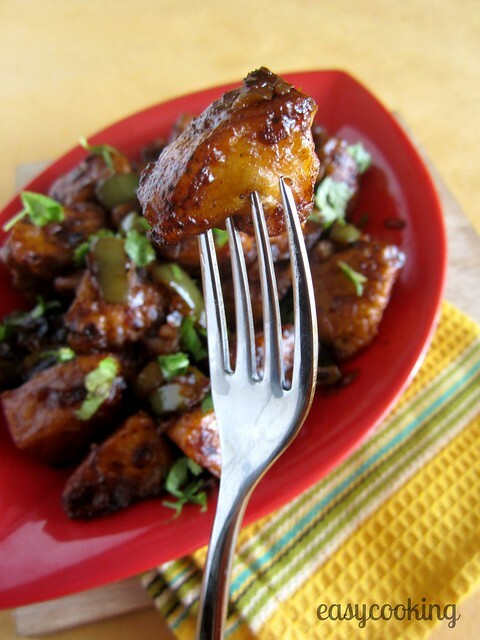 slurrrrrrrrrrrrrp finger licking idli manchurian.In chinese menu I really love the cauliflower manchurian.This idli one also sounds yummy. 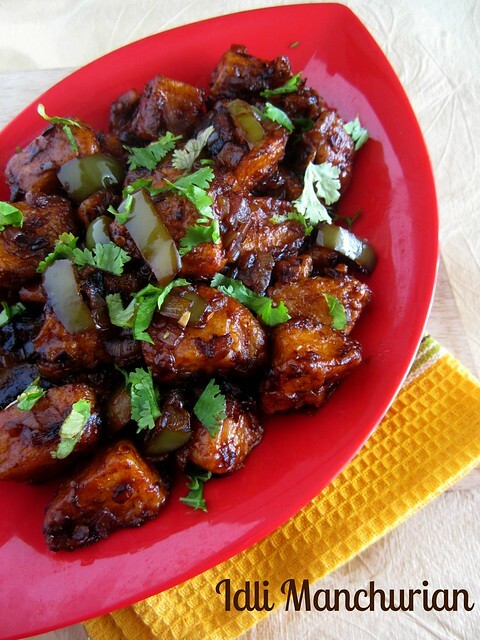 tempting idli manchurian. i love eating it at hotels. nice way 2 do at home. could u pls suggest where i can buy dark chocolate in chennai,which u are specified in baking session. so far i used hershley and cadbury. pls any one let suggest the shop to buy baking items. I get my stock from Cochin but you can try out Nuts and Spices and Brown Tree outlets in Chennai.For baking supplies,check out Viveka/Venus Essence mart on Waltax road,adjacent to Central station. Oh my god. Such a brilliant idea. It looks SO good. Please teach me how to click such beautiful pictures! Yum...perfect meal for any day! 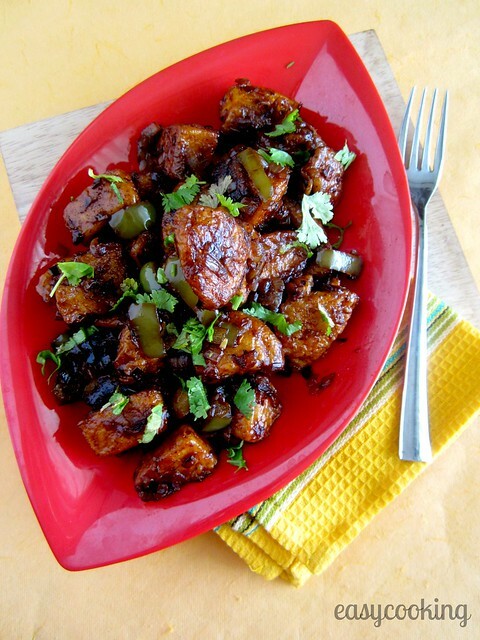 Slurp,irresistible idli manchurian..Makes me hungry.. I just love idlis and this looks even more tempting than original idlis! Thanks for sharing. I just happened to have hit upon your page by accident.. very well written out recipe and pictorial presentations are also good.. I hope I can make the dish as well as its presented here. Thanks. 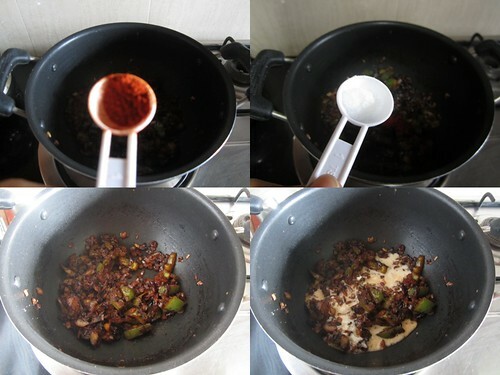 Thanks for this recipe and the efforts taken to post the step by step process in such great detail.